Comments: One of forty species in this genus that occur in North America north of Mexico, most of which are found in the West (Cigliano et al., 2018). Only two species have been recorded in North Carolina. Comments: A medium-sized, strongly mottled Band-wing. The ground color of the head, thorax, tegmina, and legs is variable, ranging from gray, blue-green, to brown (Blatchley, 1920), or pale greenish-white in some of our specimens. All of the exposed surfaces are heavily splotched with irregular spots of dark brown, with both the tegmina and hind femora crossed by two or three stronger bands of fuscous. Overall, the color and patterning of this species is very well suited to camouflage it within the lichen-covered, rock outcrop habitats of this species. As in several other of our Band-wings, the hindwings are yellow at the base and bounded outwardly by a band of dark fuscous. Saxatilis is unlikely to be confused with other members of this group, however, particularly on the rock-outcrops that it inhabits. Some confusion might exist, however, with Melanoplus punctulatus, which may occur on rock outcrops where scrubby trees are present, but the red coloration on the inside of its hind femora, along with its prosternal spine and other structural features, should easily distinguish it. Habitats: Strictly confined to open rock outcrops throughout its range (McNeill, 1901; Morse, 1904; Blatchley, 1920). All of our records come from such habitats, ranging in elevation from 2300 ft at Stone Mountain to 4,931 ft at Whiteside Mountain. Diet: In a detailed study of the diet and ecological energetics of this species, Duke and Crosseley (1975) found that this species feeds primarily on a moss, Grimmia laevigata, but that lichens were only occasionally used (feeding on grasses and forbs was not investigated). One important finding is that saxatilis is one of the very few primary consumers in this ecosystem, playing an important ecological role. Abundance/Frequency: We have too little numeric data for this species to judge its abundance, but it appears to be fairly regularly observed at certain sites. 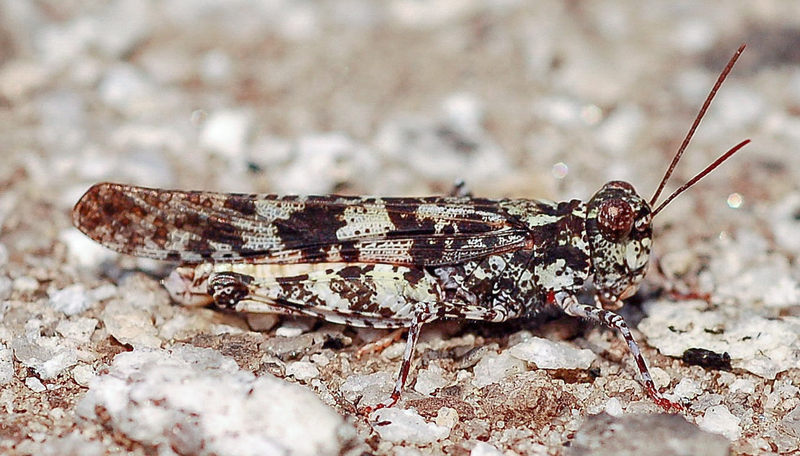 In Georgia, Duke and Crossley (1975) recorded a density of 0.76 individuals per square meter, which was far lower than other grasshopper populations. Comments: This species is known from relatively few sites in North Carolina, where it is highly restricted to very patchily distributed habitats. Although no specific threats are currently known, the habitats this species occupies are completely exposed to adverse weather events, which are likely to increase in frequency and severity due to climate change. Populations need to be monitored for the impact of these events.